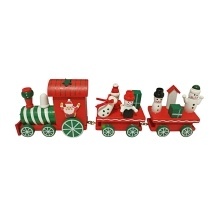 Beautiful and cute tiny train design, ideal to decorate Christmas tree to light up festive atmosphere and make your home a new fresh appearance. Made of premium and natural wood material for long lasting use. Engine and carriages are linked with brass fixings and cannot be separated. Perfect for Christmas decor, party favors for birthdays, weddings, graduation and Children gift.